Any Washington, DC, wedding photographer will tell you that two newlyweds’ first dance is a great occasion for taking gorgeous pictures. This image of a bride and groom dancing at St. Francis Hall in Northeast DC is certainly evidence of that! It is an image that communicates so much of the joy that the couple was feeling on their wedding day. The photograph shows the connection that drew the bride and groom to the altar in the first place. And that makes it the kind of image that the couple will treasure forever. There are a lot of elements of a couple’s first dance as spouses that make for beautiful DC wedding photography. For starters, it is a part of a wedding day that combines both predictability and genuine emotions. As photojournalistic DC wedding photographers, we create images that take our couples on an emotional journey through their wedding day. That means that we focus on taking pictures of unscripted moments, as opposed to photographing staged set pieces. Knowing exactly where the bride and groom are going to be ahead of time is a huge help for us. We can map out the shots we want, arrange the right lighting and be ready to capture moments on film. At the same time, the resulting images of the newlyweds dancing never seem staged. 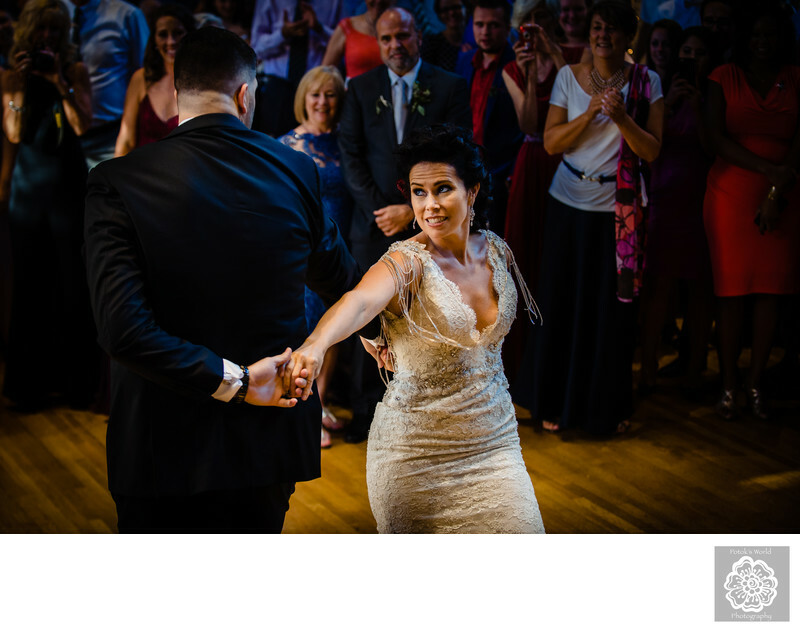 Though the first dance is technically not a spontaneous moment, the emotions the bride and groom feel are very real. So the pictures of that part of their Washington wedding day are still photojournalistic, and look genuine and beautiful. Another reason why every Washington, DC, wedding photographer loves taking pictures of first dances is the type of emotion displayed. DC-based brides and grooms experience such a broad range of feelings on the day they tie the knot. Nervousness obviously plays a big role during the getting-ready portions, as does a bit of impatience. Surprised joy shows on the faces of grooms during the first look. Spouses-to-be also experience moments of sadness if they are reminded of loved ones who could not be present. We frequently photograph relief on the faces of newlyweds who have finished exchanging rings and having a first kiss. But the emotion we see most often during the first dance is happiness. The hard part of a DC wedding day is over. Rings are on their fingers, and they are married. Now they can just enjoy being in each other’s arms and look forward to a rollicking Washington wedding reception. The way that DC brides and grooms show that happiness varies from couple to couple. Sometimes it comes out in the slight smile on a bride’s face when the groom whispers something in her ear. At other weddings, it is evident in the tear the groom sheds as he holds his now-wife close. And occasionally, the newlyweds’ joy is so obvious that no one at their Washington, DC, wedding reception could miss it. As was the case with this bride and groom. We love photographing those moments of happiness in whatever way they manifest themselves on a wedding day. But when newlyweds get as excited as these two did, it certainly makes our jobs as DC wedding photographers easier! The more evident the emotions, the more impactful the photos of a first dance are going to look, obviously. Similarly, pictures of that part of a Washington wedding will be more dynamic if the couple does a choreographed dance. Which is what this DC bride and groom did. Eschewing the traditional twirling around the room in favor of something quirkier can inject a lot of fun into a wedding reception! Keywords: DC wedding photographers (48).